In one of the boldest moves seen in the art market history, Gurr Johns, a 103-year-old independent appraisal and fine art advisory firm has acquired over $155 million worth of Picasso’s artworks in only 24 hours. 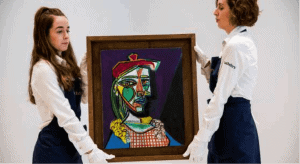 The first round started at Christie’s Impressionist and Modern Evening sale on the night of March 27th, when the company spent more than £40 million on 9 Picassos. The following day, Harry Smith, Chairman of Gurr Johns, continued his buying streak at the last Sotheby’s Impressionist and Modern Evening sale, picking up all four Picassos on offer for a total of £73.8 million ($102.4 million). For whom was he buying all these Picassos? Who is cornering the market for the Spanish artist? One theory according to Artnet was that he might have been buying on behalf of a client from the Middle East, since he was sitting next to the company’s consultant of such region. Behind the headlines of Bloomberg, Artnet, The Art Newspaper and other press, why spend this amount of money so openly in public? Although private dealership could have better served the company’s financial interests, this Picasso marathon has placed the team of Gurr Johns in the limelight. This has never happened before for the company, not even last October 2017 when they announced their acquisition of the auction houses Dreweatts and Bloomsbury from Stanley Gibbons for £1.25 million. The possibility of saving almost $20 million in commissions through private acquisitions and better resale profits might not appear to be so attractive these days. In contrast, this “free” publicity seems to have become a hot commodity these days. 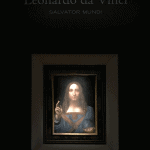 The unforgettable $450.3 million sale for Salvator Mundi last November printed the name of Prince Bader bin Abdullah bin Mohammed bin Farhan al-Saud, a “little-known” Saudi Arabian prince –with no history as an art collector– in every newspaper around the globe. This ego trophy immediately conferred the title of connoisseur on the buyer and opened the doors of the Louvre Abu Dhabi to the rest of the world. Similar to the 15 minutes of fame caused by Yusaku Maezawa, the Japanese billionaire who bought a Basquiat painting for a record $110.5 million earlier in 2017, it seems that the marketing departments are taking advantage of the international spotlights that surround the auctions. Far from being a victim of these ego-thrived bidders, the art market is the true winner from these marketing strategies. Despite Picasso being dethroned by Da Vinci as the most expensive artist at auction last year, his market is too large to conquer. Although the market has a fairly regular supply of Picassos, there is a constant desire for top quality, brightly colored works whose prices seem to continuously rise. For instance, the insatiable desire for this artist accounted for 62% of Sotheby’s Evening sale total and 34% of Christie’s auction in the same category, achieving a total of £233 million in only one week. Including, Femme au béret et à la robe quadrillée (Marie-Thérèse Walter), which sold at £49.8 million (above an estimate in excess of £36.5million), the second highest amount paid for a work of art in Europe. 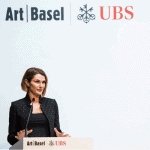 Either used as a marketing tool, an uncorrelated investment heaven, a new-rich pedigree accreditation, an ego-thriven trophy, a museum’s sustentation, or simply a connoisseur’s passion; it all indicates that the art market is stronger than ever. The change of motivation behind the acquisition of artworks may change, but its voice is undoubtedly linked to our lives. Gleadell, Colin. 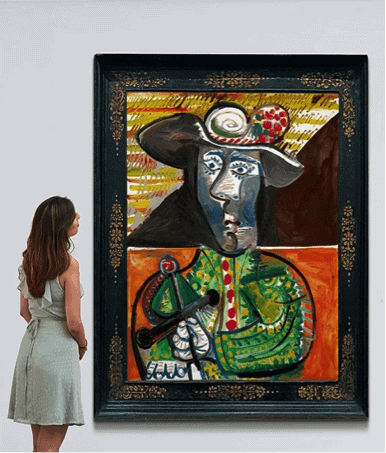 “A Petite $69 Million Picasso Leads Sotheby’s Solid $189 Million Impressionist Sale in London.” Artnet News, 28 Feb. 2018, news.artnet.com/market/picasso-sothebys-impressionist-modern-sale-london-1233899. Chesters, Laura. “Gurr Johns buys auction houses Dreweatts and Bloomsbury.” Antiques Trade Gazette, 2 Oct. 2017, www.antiquestradegazette.com/news/2017/gurr-johns-in-talks-to-buy-auction-houses-dreweatts-and-bloomsbury/.